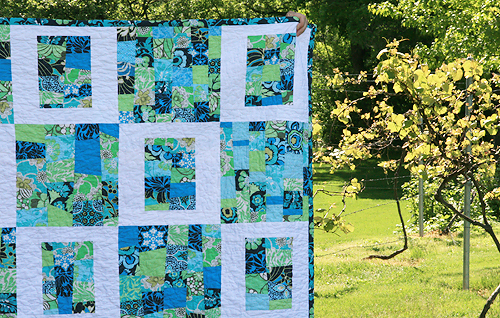 I am so excited to show you my completed quilt from the Sew New to Me Virtual Quilting Bee. I named this one Seaside States - "Seaside" because it really has a beachy feel to me, and "States" because it was made using the Map of the States technique by Elizabeth of Oh, Fransson. 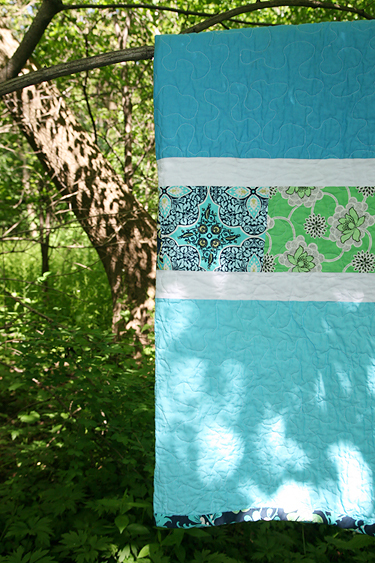 The blocks and binding were created using Amy Butler's Daisy Chain collection. 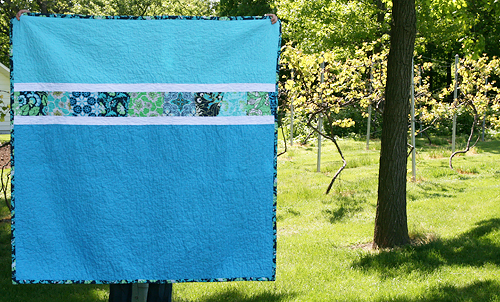 I used 2 tones of blue for the back of the quilt. Both are Kona solids, Peacock and Bahama Blue. The blocks down the middle coordinate in style with the front, with slightly wonky sides. I quilted it free motion and the final size is a 60" square. 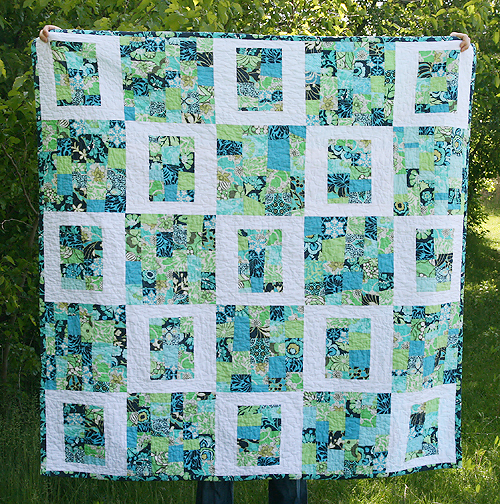 For those that aren't familiar with virtual quilting bees, we have 12 people in our group. Every month someone sends fabric to the other 11 people and we sew blocks based on their instruction. The blocks are then mailed back and incorporated into a quilt. The very talented group of ladies created the blue and green blocks for me and I added in the blocks with white sashing. I am new to the online quilting community and this was just the best experience. I really hope to be involved in another bee once this once is finished. It is a great way to be challenged each month and work with a variety of fun fabrics! I hope everyone out there is having a fabulous Mother's Day and gets at least a little time of rest and relaxation in today!